Rob Lowe hits London with his show Stories I Only Tell My Friends: LIVE! Who can resist Rob Lowe’s charme? I am delighted to attend his show Stories I Only Tell My Friends: LIVE! At the end of the day, these type of ‘intimate’ events are so charming because they get us closer to our favourite Hollywood stars who often seem like living in a remote world. 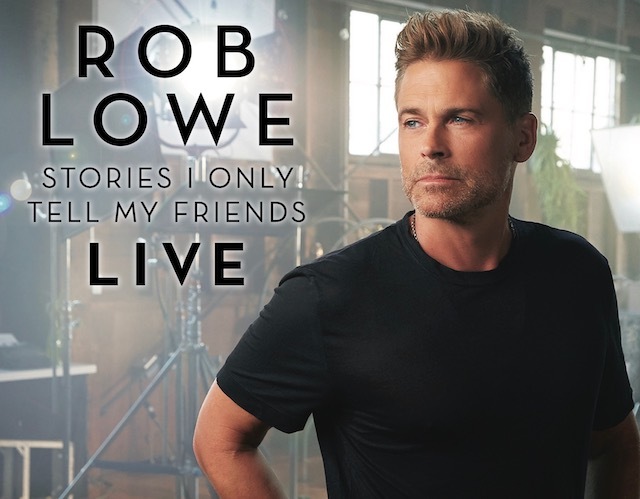 After a sell-out US run, Rob Lowe brings his one man show, Stories I Only Tell My Friends: LIVE! to London, for a very special show at The Royal Festival Hall this Saturday 1stDecember 2018, plus an extra show has just been added at The Brighton Dome on Saturday 16thFebruary 2019. I’ll be adoringly listening to him from very close tomorrow night hoping for a glimpse… At the end of the day, who didn’t like him in The Outsiders? Even surrounded by the best male stars in Hollywood at the time, like Patrick Swayze, Matt Dillon and Tom Cruise, he was a stunner. Inspired by the success of his two NY Times best-selling memoirs, Stories I Only Tell My Friends and Love Life, Rob has created an honest, hilarious, all-new, peak behind the curtain at Hollywood, fame, fatherhood, marriage, and a life lived at the forefront of culture for four decades. From the Brat Pack to The West Wing to Parks and Recreation and beyond, Stories I Only Tell My Friends: LIVE! is packed with witty fun and one of a kind insights spanning an iconic career. Broadway World’s review says it all: “As personable and charismatic of a presence onstage as he is onscreen. The humour is first-class with the jokes and funny anecdotes keeping the audience in stitches”. Tickets for both the London show and the Brighton Dome show on sale now. This entry was posted on Friday, November 30th, 2018 at 2:03 pm and is filed under Attractions. You can follow any responses to this entry through the RSS 2.0 feed. Both comments and pings are currently closed.